Meriamm-Webster says that terse means “using few words : devoid of superfluity” or alternatively “smoothly elegant”. 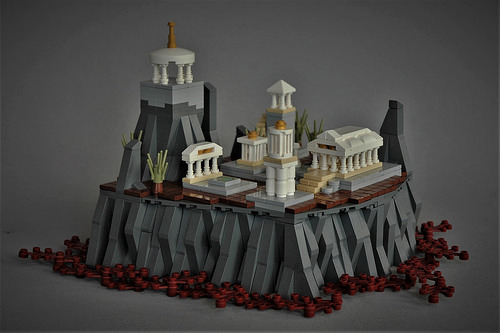 Andreas Lenander’s temple creation is a terse LEGO build if I’ve ever seen one. Not one piece is wasted and not one piece seems to be out of place or excessive. What could be described as a minimum viable amount of rock work composes the base, and dark red leaves on the very bottom add a nice flourish and help to soften the rocky edges as they meet the monochromatic grey background.